I am rolling out the first of four seasonal CherryGal Organics Herbal Tea blends — Summertime Tea, a refreshing and soothing blend. One of the most special components of this blend is Pineapple Sage (Salvia elegans), a member of the mint family but with a true pineapple scent and flavor and some extraordinary health benefits. As with many mints, it is an excellent digestive aid (and reduces flatulence and acts as a diuretic), but it is also calming and soothing. Some studies have indicated it has anti-depressive and anti-anxiety qualities. In addition, it has antioxidant, anti-inflammatory and antimicrobial properties and contains Vitamins A and K (liver support). Pineapple Sage’s expectorant component and astringency make it a good choice for combating sinus infections brought on by summer allergies. Since it also has estrogenic properties, it is not recommended for pregnant or nursing mothers, but may help alleviate hot flashes in menopausal women. Regular consumption reduces bad cholesterol levels and increases good cholesterol, as well as boosting your overall metabolism and contributing to weight loss. 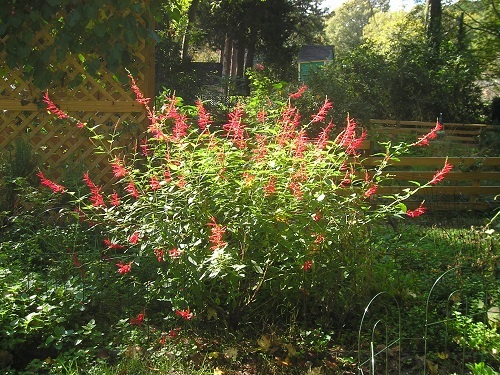 Finally, studies indicate that Pineapple Sage shows promise for treating Alzheimer’s. The essential oil from Pineapple Sage has been found to improve acetylcholinesterase (Ach) levels in the brain which improves concentration, boosts memory and information processing capabilities. The best way to consume Pineapple Sage to extract all of its goodness, is in a tea. CherryGal Organics Summertime Tea, which contains organic pineapple sage, is best brewed using water brought to a boil, allowing it to steep for 15-20 minutes, then cooled and iced. A special treat is to serve with ice cubes made from pineapple juice. I will be offering this special blend at the Warren County Farmers Market and eventually in my online store. Enjoy! This entry was posted in Garden, Health and tagged Herb Tea, Organic Herbs, Pineapple Sage by Cherry Gal. Bookmark the permalink.